They said that when you want something and keep thinking about it, the universe gives you what you’re asking for. It was the fourth week of May, and I just realized just how big a commitment I signed on when I agreed to do PHL360°. I needed to take a break, at least for a while. Then came an e-mail bearing the best news. “Would you like to spend 4 days and 3 nights at any Shangri-La property around the world?” I’m paraphrasing, but basically, that was the content of the email. I was beside myself with joy, and I had to read the email several times, going through each word with care, to be certain that I did read it right the first time. I did, and I was now faced with a tough decision to make: which Shangri-La property? Yup, definitely made the right choice choosing this resort. I hightailed it to the Shangri-la website, and was met by stunning photos. I’m a sucker for beautifully designed websites, and with the new site, it just made it a tad harder to pick between hotels. 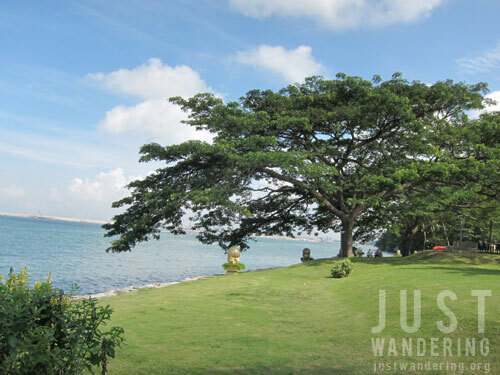 Having been stuck in Manila for more than a month, I was itching to get out of the city and be near the sea. I knew right then that I have to go to a resort, not a hotel. That narrowed my options, even more so when I had to limit it to a place that I can afford to buy a ticket to — the offer was only good until August, and as much as I would have loved to go to Fiji, getting the funds to go there is just not possible. I made up my mind and picked Singapore, with Boracay as my second choice. Decision made, schedule set, tickets booked, and before I knew it, I was flying to Singapore. They arranged for airport transfers for me, and true enough, there was an attendant bearing the Rasa Sentosa sign when I came out of the arrivals gate. My brother was meeting me at the airport as well, so I can give him the Yumburgers he asked for, but he was running late. I told the attendant (who turned out to be the driver as well) this, and she said it was okay, since it would save me from having to walk to the carpark. So while waiting for my brother, she went off to bring the car around. Years ago, while I was walking in Makati, I saw these black cars with the gold Shangri-La logo painted on its side. I wondered when I’ll be able to ride one of those fancy hotel limousines. Turns out July 17, 2012 was that day. I walked out of the airport doors and was met with a black Mercedes Benz. Fancy! It was a comfortable 30-minute ride to Sentosa, only slightly marred by my battle with my brother’s mobile phone. To give some context, I asked if I can borrow his extra sim card (which was actually the same sim card I used on previous trips to Singapore), and he gave me the phone to use with it. I was trying to figure out how to set up the mobile internet on it and was rapidly losing my sanity with autocorrect. I was so distracted, that when pulled up to the resort, I was startled to see a man dressed like a cross between Peter Pan and Robin Hood reaching for the car door. 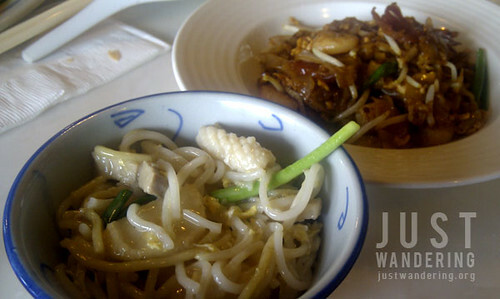 Fried hokkien mee and Char kway teow! Happy! Stepping out of the car, I was warmly welcomed by Rasa Sentosa’s marketing team, headed by Jennifer Yong, Director for Sales and Marketing, along with Rae Tang and Koay Yee Ching. Check in was a breeze, and soon Rae and Ching are leading me to 8 Noodles for lunch. I was thrilled by this turn of events; I did some online snooping on Rasa Sentosa and its restaurants prior to the trip, and read that 8 Noodles had pretty good, well, noodles. And they did. The fried hokkien mee and char kway teow were the perfect first taste of Singapore. Those lounge chairs are evil! They are clingy! They will not let you stand up and walk away without a fight! After lunch, we went for a tour of the resort, starting with the beach and the pool. 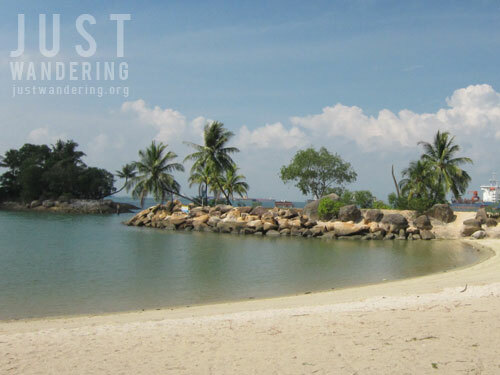 Rasa Sentosa is located at the end of Siloso Beach, with an exclusive strip of the beach for its guests. Here, guests can lounge in beach chairs or rent non-motorized water sports equipment, and kayak or paddle in the water. Though it was a weekday, the resort seemed to be packed, with a bulk of the guests sunning or keeping cool in the pool. There are a couple of pools for kids, with manned slides, and a water playground. For the bigger kids, a huge swimming pool awaits you, with two jacuzzis. At that moment, I knew where I’ll be spending the afternoon. 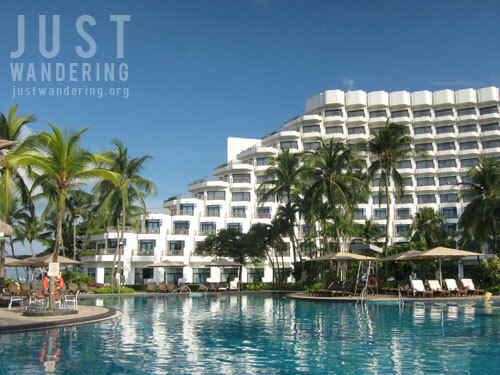 Interesting tidbit: the Rasa Sentosa swimming pools employs a particle physics-based water management system to keep the water in a natural state, where only the minimum statutory amount of chlorine is added. Since the resort gets a lot of families on holidays, many of the facilities are aimed for them. There are ping pong tables to keep both kids and adults preoccupied. Parents who are looking for a break, can leave their kids at the Cool Zone, a supervised play area for kids, where they can play games, make crafts, or climb up and down the 3-storey high tree house. What impressed me most are the washer and dryer available for guests to use, which is fantastic alternative to the expensive laundry service that charges per piece. Another is the water and ice dispenser that is available in each floor. No more need to worry about running out of complimentary water in the middle of the night! I want to be a kid again just for this. Photo courtesy of the resort. 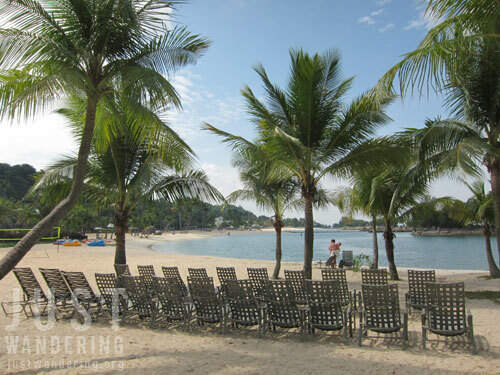 Rasa Sentosa has 10 room types, giving guests plenty of options, depending on their needs. They toured me to view two types of suites, the Panorama Suite, which has amazing views of the South China Sea and comes with a huge balcony where you can sunbathe or dine. The other one is the Deluxe Sea View Suite, which has its own outdoor jacuzzi and a small lawn that looks out towards the pool. The tour ended with my room, a Deluxe Sea View room. 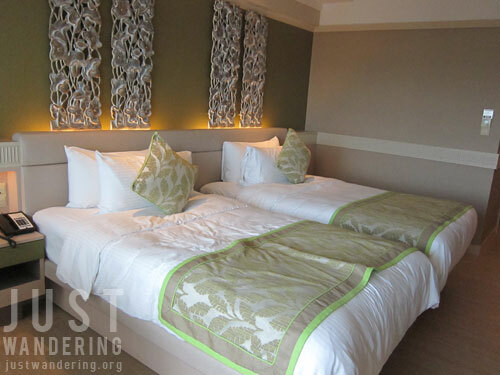 Like the other rooms, it has a green wall, accented by a floral motif above the beds. Maybe it’s just my mindset that time, but the room made me feel so relaxed when I’m inside. It has the usual amenities: the mini bar, the LCD TV, toiletries (which, much to my delight, laundry powder), pillow menu, but when I got there, I was only after one thing: Internet. This is how an online travel reality show is made. Shangri-La Rasa Sentosa has wi-fi throughout the resort. I was able to go online on my laptop from the desk, I can check emails while sitting out at the balcony, and I was even able to upload a blog post from the poolside. Funny side story: One morning after breakfast, I went down to the pool, intending to take a photos, post the blog and walk down Siloso Beach. I took the photo, sat down on an evil lounge chair to upload it, and next thing I know, two hours have passed. 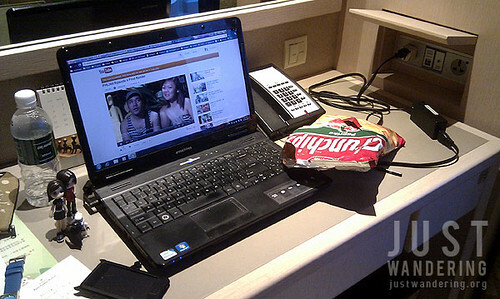 Now I completely understand what Jake and Helen were saying about hotel living. My photo does not do it justice. That night, I met once more with Rae and Ching for dinner at Barnacles. We were joined by Margaret Tan, the Digital Marketing Manager of Shangri-La Hotel Singapore, and Ron of Fliptravels. It was a fun, laid back dinner, filled with tales of travel and mangoes. 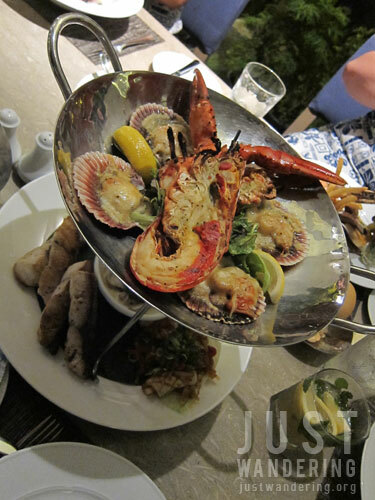 Most of us had seafood, Barnacle’s specialty, accompanied by refreshing mocktails and fresh sea breeze. It was a good night to be dining outdoors. We were serenaded by their roving band of musicians, playing hits as requested. Start the day right with bacon! We adjourned for the night around 9pm, but our [mine and Ron’s] didn’t end there. Because it was a Tuesday and we had Internet connection in the room, we were able to screen PHL360’s Episode 4, make our comments and work on the subtitles. Sometimes, I think having free wi-fi is a curse. Soon enough, the beds were able to successfully tempt us to sleep. I slept through my alarm, and if it weren’t for Ron waking me at 10am, I would have slept through till noon. We made it just in time before the breakfast service ended. 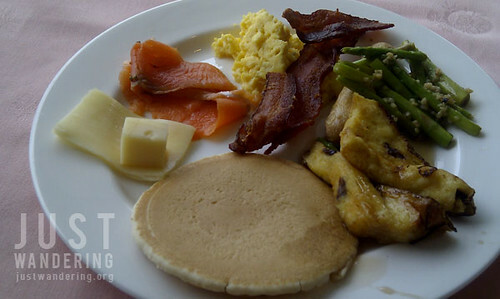 The buffet breakfast is usually served at the Silver Shell Cafe on the 3rd floor, but during peak periods, the Horizon Pavilion is also open for breakfast. There is ample variety to fit any diet, taste, or in my case, craving. That morning, I went with mainly Western choices of pancakes, cheese and cereal (fine, Froot Loops). 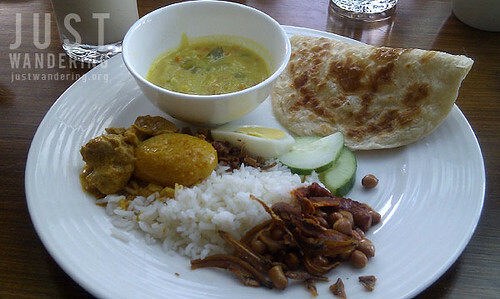 The following morning, I had my fill of nasi lemak and roti prata, washed down with cold soya milk. The Silver Shell Cafe serves both buffet and ala carte, so you’ll never get hungry. Ching and I had lunch here on my third day. Actually, it was a choice between Silver Shell and Trapizza, the resort’s Italian restaurant, but we were standing right before the dessert station. It was a no brainer: chocolate wins everytime. And what glorious chocolate it was. Truth be told, I’m not too excited about the caked and pastries in Singapore. Blame it to growing up on sickeningly sweet cakes in the Philippines, but I have yet to try cakes in Singapore that made me happy (except for the home made cakes by my sister-in-law). The streak ended on that Thursday. 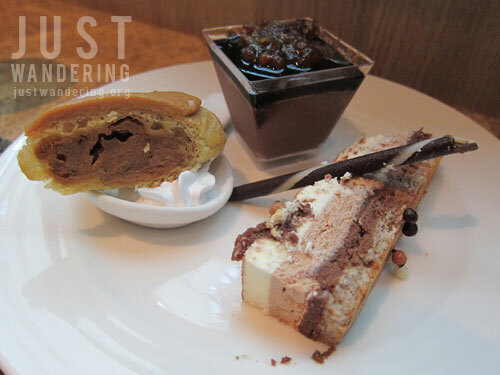 I picked up a chocolate parfait, a chocolate mousse and a mocha eclair. They were all good. It wasn’t sickeningly sweet, which I really appreciated, yet it wasn’t lacking in flavor either. They were perfect. Kid’s buffet, photo courtesy of the resort. There are never any shortage of kids in any resort frequented by families, and though I don’t have kids of my own, I love that the Silver Shell has a small buffet area for kids. The counters are kid sized, and have dishes that kids would enjoy. I say this with much envy, and regret that I was too proud to be seen getting food from there. Ras Spa’s couple room. Photo courtesy of the resort. Another experience that Shangri-La wanted me to have was their signature spa experience. I’m not much of a spa-going person, but after that experience, I realized the appeal. Rasa Spa is located at the ground floor, with the entrance tucked away in a discreet pathway. When you’re inside, you feel as if you’re worlds away, even if the pool is right outside. There was of course, the relaxing spa sounds, the calming tea, and the professional masseuse who kneads your body just how you want or need it. One of the many peacocks of Sentosa. It was a great four days. Though I was working half the time I was there, the other half spent just lolling about by the poolside (nearly falling asleep in the jacuzzi even), or stalking peacocks, were really memorable. It’s not one of those trips where you feel like you have to to everything, more like the kind of trip that encourages you to take it slow and enjoy the good things life brings you. Toots! 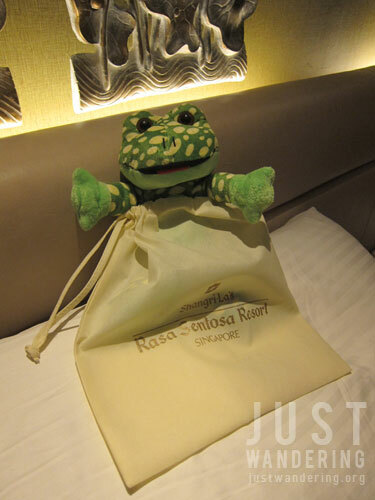 A parting gift from Rasa Sentosa. Much love and appreciation goes out to Rae, Ching, Margaret, and Jennifer of Rasa Sentosa Singapore; Bonnie Ang, Corporate PR Manager of Shangri-La Hotels and Resorts, and; Mandy Suen of Ogilvy, who found my blog. It was an experience I will never forget! the universe loves you, nina. i want to meet shangri-la people too! hahaha! i was smiling the whole time reading this post. 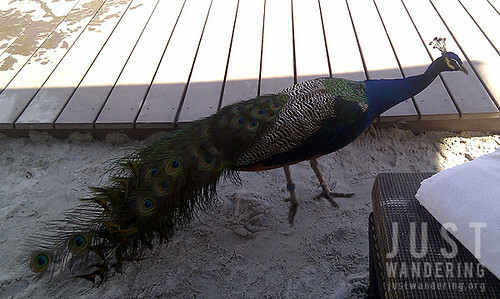 i remember you mentioned about that yumburger-requests of your brother and that lovely peacocks roam around the resort freely. Haha, I’m just lucky they found me! I didn’t know it was Shangri-la resort when I walk along the shore of Siloso Beach until I read this entry. Maybe I was preoccupied then, watching people burning their skin from scorching heat of mid noon sun. This is the reason why I’d want to be a travel blogger! fun! OMG, I’d definitely go for the food. Oh, and the pool. Oh, and the kid zone area. Oh, and the beach. Oh, did I mention the food already? I love how it seems catered to families, particularly with the activities parents can enjoy with their children. The buffet for the little ones is just pure brilliance. So…when you have kids, I know where you can take them, Nina! Have you stayed at other Shangri-La properties? If so, how would you rate this one compared to others? Still, I’d mainly go here for the food. LOL. What a great review of this hotel. You’ve really painted a beautiful picture (both with your words and photos). The food looks amazing and the rooms sound perfect. Surely Shangri-La pulls out all of the stops at their other locations as well!